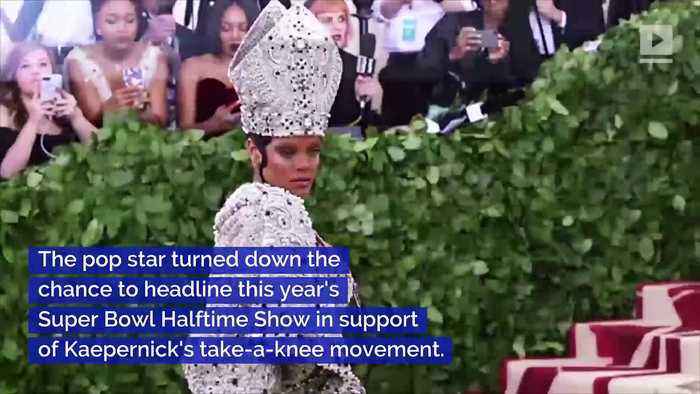 Rihanna Voices Support for Colin Kaepernick During Super Bowl The pop star turned down the chance to headline this year's Super Bowl Halftime Show in support of Kaepernick's take-a-knee movement. On Sunday, Rihanna made fun of a passenger who was on the same flight as her because he wanted to know if he'd be able to watch the Super Bowl. The Bajan star called the passenger a "weirdo" on her Instagram Story while making faces. Hours later, Rihanna reiterated her support for Kaepernick by sharing an illustrated drawing of him.